I love simple and delicious side dishes. Sometimes, I get tired of eating only broccoli, peppers, green beans etc as a side dish and I want to add a few starchy vegetables. This recipe for crispy pan fried potatoes is the perfect side for almost any meal – poultry or beef go wonderfully together. It also comes together in about 10 – 15 minutes, and basically, you can cook it while you cook your meat. 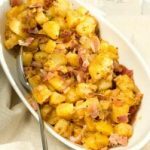 Or if you have any leftover meat, just add these crispy pan fried potatoes as a side and a light salad, and you have an easy and delicious meal. These potatoes are very flavorful, smoky and soft. The seasonings on these crispy pan fried potatoes make all the difference. The chubritsa spice is the star of this recipe! It adds a really nice deep, smokey and salty flavor to the potatoes. The chubritsa and the paprika are what gives these potatoes a golden color and delicious flavor. Don’t be surprised if you find yourself reaching for seconds… or thirds. My husband had seconds and was raving how delicious they were. If you haven’t tried chubritsa yet, you should. You will never want to cook without it anymore. It is so versatile, you can use it on almost anything. Meat, vegetables, cheeses, soups, rice dishes, avocado, omelet, hard boiled eggs and even toast. Just sprinkle on your favorite food and enjoy! One evening my husband made a spice rub for the steaks using the chubritsa spice, and they turned out amazing! I am not exaggerating at all, just add some butter, chubritsa and season lightly with salt. Perfection! It’s also a great seasoning for deviled eggs. 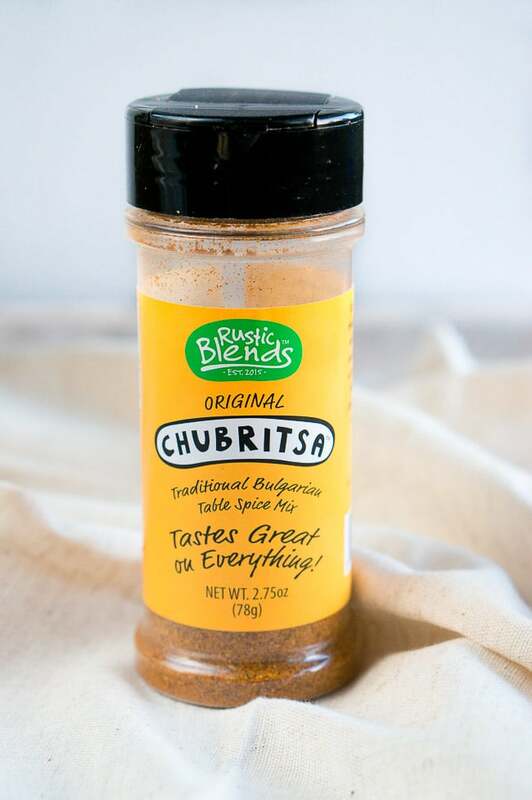 Chubritsa is a popular Bulgarian table spice mix that consists of simple spices and together they create an amazing flavor combination. Rustic Blends is a family owned and operated business that shares their love for the Bulgarian table spice with the world. I am so glad I found their website and this spice. I have been looking for Bulgarian spices for a long time and I was so excited when I found this one because it’s hard to find this particular spice here in the States. 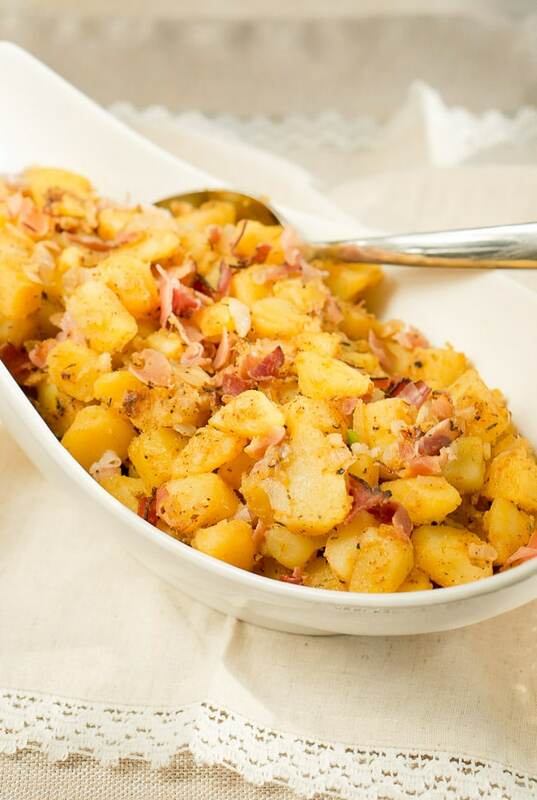 Hope you enjoy this recipe for crispy pan fried potatoes! 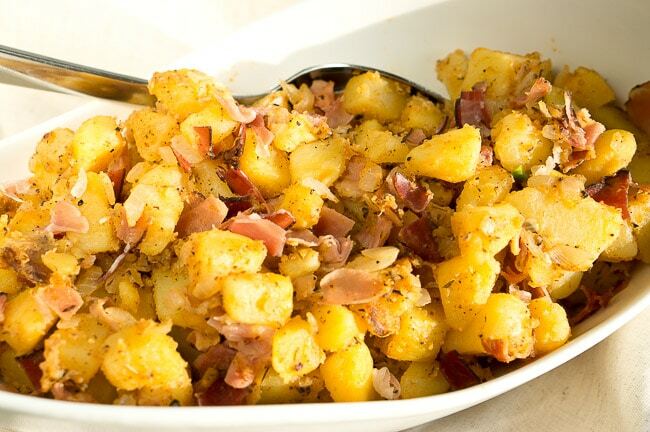 Place cubed potatoes in a medium pan, cover them by 1 – 2 inches with water, and add 1 tsp salt. Boil the potatoes for about 5 – 7 minutes until they are somewhat tender but not completely cooked. Using a slotted spoon, transfer potatoes to a large mixing bowl. Season them with chubritsa, Himalayan salt, paprika & freshly ground black pepper. Toss to coat. In a large skillet heat oil over medium-high heat. Add chopped onions, and saute for couple minutes until they are translucent. Add seasoned potato cubes and stir everything. Cook for about 5 -7 minutes until potatoes are cooked through and golden brown. Add prosciutto (or cooked bacon) and stir well. Transfer potatoes to a serving bowl. Enjoy! Delicious and crispy pan fried potatoes - they have an amazing smokey flavor and are absolutely delicious!! You will be reaching for seconds and thirds. Place cubed potatoes in a medium pan, cover them by 1 - 2 inches with water, and add 1 tsp salt. Boil the potatoes for about 5 - 7 minutes until they are somewhat tender but not completely cooked. In a large skillet heat oil over medium high heat. Add chopped onions, and saute for couple minutes until they are translucent. Add seasoned potato cubes and stir everything. Cook for about 5 -7 minutes until potatoes are cooked through and golden brown. Add prosciutto (or cooked bacon) and stir well. Disclosure: I received free chubritsa sample from Rustic Blends for a product review. If you want to try some of their products, please visit RusticBlends.com. As always, opinions remain 100% my own. I could make a meal just out of the side dishes! They’re my favorite! Love these potatoes, they look so flavorful and delicious! Paprika on potatoes is so good. I can just imagine some runny poached eggs on this. 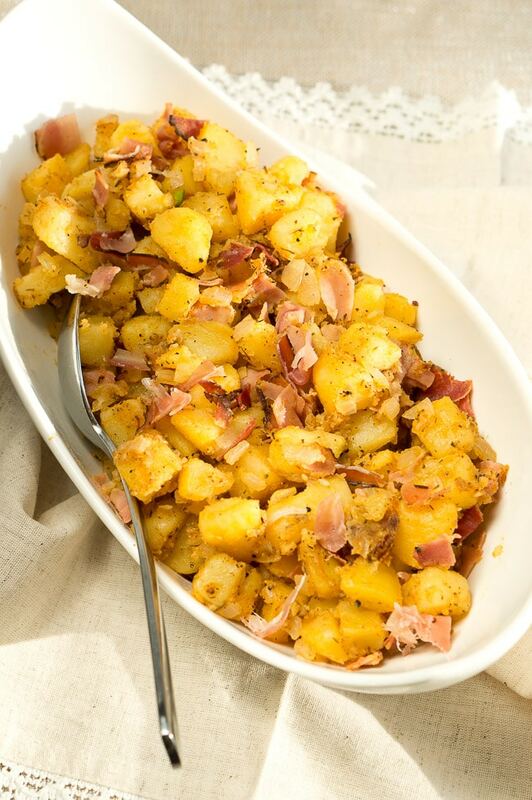 Potatoes aren’t a sometimes thing for our house, they’re an every other day dinner accompaniment – love them! Have never seen this spice though – very cool. I love, love, love side dishes! But I’ve never heard of chubritsa before. Sounds interesting, and these potatoes look delicious. These look perfect for a weekday breakfast for the kids before they head off to school! Love it! !